Slobber Straps: What Are They? Slobber straps are pieces of leather that attach reins to a bit. Below are details about what slobber straps are, and how they differ from water loops. Slobber straps can take a lot of everyday wear and tear off of expensive reins. 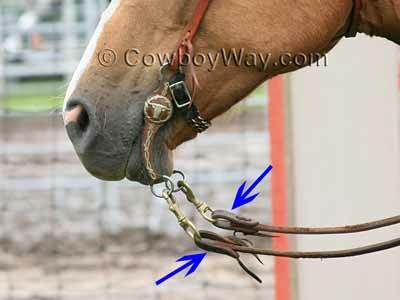 For example, if a horse takes a drink while wearing reins with slobber straps, the slobber straps will help keep the reins out of the water. They are designed to be easily removed and replaced. Some reins can be very lightweight. Lightweight reins, when picked up on and released by a rider, may be so light that both horse and rider don't get a good "feel" through them. 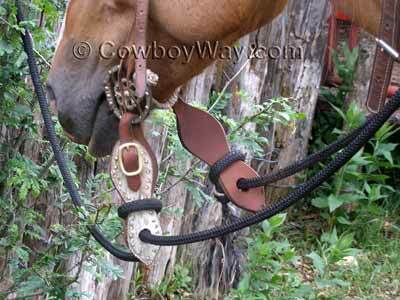 Slobber straps can add enough weight that both horse and rider can more easily feel communication through the reins. Some styles of reins, such as mecates, are not easily attached directly to a bit. In this case, the slobber strap is attached to the bit and the mecate is attached to the slobber strap. Slobber straps can be plain, or fancy with tooling, lacing, buckles, conchos, etc. They can be used with mecates or split reins. Below: Cowhide-covered slobber straps being used with a nylon mecate. A "water loop" is similar to a slobber strap. Water loops are smaller and less fancy than slobber straps, but share some of the same purposes: They take some of the regular wear-and-tear of daily use off of the reins, they can add a little bit of weight to help enhance "feel," and they make it easy to attach reins to a bit. However, since most water loops are smaller, simpler, and a lot less fancy than many slobber straps, they're typically far less expensive to replace if worn out or broken. Some people use the terms "slobber straps" and "water loops" interchangeably, but most folks consider them to be two different, if somewhat similar, items. Below: The blue arrow is pointing to what are frequently called "water loop" ends or "rein ends" being used with a pair of leather split reins.